Here’s this Weekly Glance of Awesomeness, extra crunchy with mild spices. I hope you enjoy it! The Breakdown: Blocklites are a neat concept that allows signs to be visible during daytime, while being invisible at night when looked at with lights at night, or vice versa. I love any innovative ways to advertise (Have you seen beamvertising? Pretty sweet! ), so this new product definitely piqued my interest. 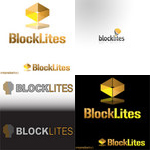 Blocklites needs a snazzy logo design that is simple and strong, yet able to capture their target audience. Check the project out! The Breakdown: Ignighter is a new dating website with a twist. Instead of those awkward, uncomfortable “breaking the ice” first dates, this service sets you and your friends up in a group dating environment. It’s always nice to get a second (or third, or fourth) opnion from your buddies! 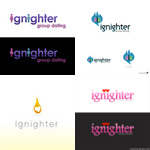 Ignighter thinks their name is very appealing to males and would love to have a female-friendly logo that makes the ladies feel like this is a safe, fun, and cool way to get their date on. The Breakdown: Well, the title of the project says it’s “frickin’ cool,” so I had to pay attention! VideoNewsletters.com has come to crowdSPRING to find the design for their video e-book. The business publication outsourcing company needs a sleek, irresistible print design that companies can’t put down. I guess it should be frickin’ cool as well. crowdSPRINGaholics, I know you are up for the challenge! The Breakdown: With the words cute, adorable, and cuddly, you’d think they were asking for an illustration of us (Har har har)! But I guess those adjectives could be used to describe a red panda as well. This buyer is looking for mascot for his new website that will appeal to mass consumers. 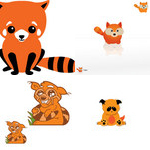 I guess if you can’t have the puppy cam, cute red pandas are the next best thing! There you have it for this week, folks. That’s your Weekly Glance of Awesomeness! See you next week – same(ish) time, same place for my last glance. Sniffle.